Between the three of us, the conclusion is clear: Australia’s banking system is about to blow, potentially triggering serious disruption in financial markets. Including here in Britain. Let’s take a look at some of what the Royal Commission has found first. During the Royal Commission hearings, a witness admitted to having lost count how often his firm had mislead the regulator. All this should amount to some impressive fines and lawsuits in coming years. But the biggest issue goes much deeper. Sounds ridiculous, but two Australian fund managers went most of the way there in the course of their own research. They posed as broke graphic designers and applied for mortgages. They were offered more than they even applied for! According to the Royal Commission, cash bribes were paid to encourage mortgage brokers to overlook fraudulent supporting documents. Which is odd given they were instructed and trained to do so by the banks anyway. According to Denise Brailey, who has been on the warpath for more than a decade about all this, along with personally helping hundreds of borrowers to fight the banks, things are far worse than the Royal Commission realises. Banks “robo-approve” the loans without even checking them. My own research says they hired staff who couldn’t speak English to verify the documents. According to Australian media reports, some mortgage brokers’ associates offered the service of fake employer phone confirmations in case the bank actually tried to verify the loan applicant’s employment. One broker in a media expose claimed a banker called him up and asked why he hadn’t fudged the figures sufficiently for a loan to pass. Royal Commission research claims that bankers at one bank discussed creating a “straw man” false client to mislead regulators when they investigated. When I exposed all this in my writing in 2012, the financial services regulator in Australia sent us a warning and demanded to know who had read my reports, including their personal details. Three months before I completed my PhD, my fourth supervisor quit the university after telling me the project wasn’t theoretical enough. The bankers and regulators continue to insist this isn’t a big problem. Which is odd, because all the data they are basing their information on comes from falsified, fraudulent and incorrect documents, so they can’t possibly know. According to Brailey, the problem is utterly massive. The most interesting part of Australia’s sub-prime mess is how surprised everyone is. Why do the bankers lend to people who can’t afford their debt? It makes no sense. The usual answer is incomplete. Yes, banks stand to gain based on fees, creating a churn and burn model for borrowers who borrow and default. But what about the risk? At the very heart of the issue is something I have not seen any other analyst write about. It’s the distinction between default risk and collateral risk. While house prices are rising, it makes sense to borrow money to buy a house you can’t afford. The worst-case scenario, for you and the lender, is to sell your house. The borrower gets to keep the capital gain and the bank’s risk of not being repaid is tiny. But stick to the crucial point. While house prices rise, default risk is irrelevant because collateral risk is zero. The rising value of the house covers the bank’s risk. If house prices stop going up, suddenly collateral risk and default risk strike in a dangerous way. If bankers can’t rely on rising house prices to bail them out of bad lending decisions, the default risk of their borrowers makes a comeback. It becomes the deciding factor on whether a loan makes sense or not. Over the last few months, house prices in Australia have begun dropping. The spike in collateral risk, and the return of default risk, is leading bankers to realise they’re sitting on a time bomb. Having written billions in loans to people without any idea how many can actually afford that debt, the bankers are panicking. At the margin of this issue are interest only loans. Because borrowers don’t repay the principal, the collateral risk kicks in when house prices stop going up, not just when they fall. According to Brailey, many borrowers don’t have a clue they’re actually paying an interest only loan. They just think they have a mortgage, with no idea what sort that might be. And nobody told them about the spike in repayments which is coming as many of those interest only loans turn into normal principal + interest loans. The idea was for them to sell their investment property before then, for a tidy profit and plenty of fees for the banks. Brailey is fighting it out with bankers and regulators about just how many interest-only loans are out there. She estimates 80%, while regulators say it’s 30%. Thanks to the Royal Commission, bankers have tightened lending standards. Which is absurd given they don’t check compliance with those standards anyway. But lending is contracting. Without demand from the marginal borrower, who can’t afford to buy, house price demand is evaporating. The banks are on the hook for their dodgy loans, and for ordinary losses on their loan book. However, it’s a lesser-known fact that Australia’s big four banks are among the top 11 weightings in the MSCI Asia Pacific index along with the likes of Japanese industrial giants Toyota, Sony and Softbank. That is despite the entire Australian market accounting for just 18 per cent of the index. The potential for issues in the banking sector to spread to the broader economy should not be underestimated, ASR said. 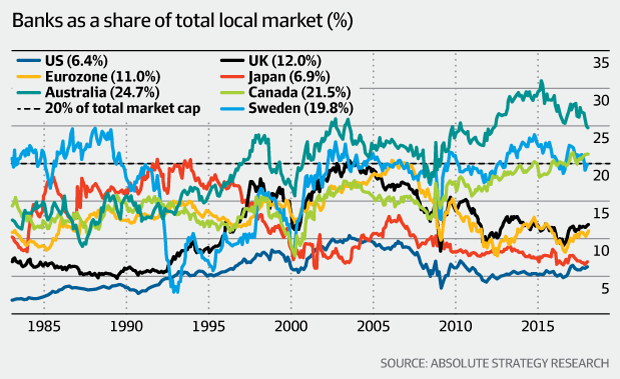 The power of a banking crisis to sink the Australian stockmarket, and pension system, is extraordinary. The big four banks make up a quarter of the ASX200 stockmarket index today, having reached over 30% in 2015, and surpassing the records set by other major economies before their banking sectors collapsed (see chart above). Which is what the first half of today’s Capital & Conflict was all about. Australia’s banks source their funds from overseas, especially Europe. With emerging markets and Italy struggling already, Australia’s banking crisis could be the butterfly that triggers a financial storm. It’s a bloody big butterfly though.